Thinking about buying a shipping label printer? This article provides detailed reviews and analysis to assist you in your search. We have spent a considerable amount of time researching different shipping label printers and have provided the best options with bullet point pros and cons of each. If you are on the fence about whether to purchase a shipping label printer, continue reading to learn the many advantages of owning one including significant cost and time savings. It will pay for itself many times over and will make your shipping routine so much faster and easier. If you are an online seller, a shipping label printer is a game changer that will make your business operations more efficient and cost effective. What is a Shipping Label Printer? Below is a side by side comparison of the shipping label printers reviewed in this article. A shipping label printer is a small printer about the size of an office phone that is dedicated to print shipping labels for your packages. Rather than using ink, it uses thermal technology to print. This is the same kind of technology that is used to print receipts at most grocery and department stores. It prints standard 4”x6” shipping labels which cost a few cents each. It is the kind of label you will find on shipping boxes for items you ordered on Amazon or almost any other retailer. The labels are made out of special material that requires heat to print rather than ink. You read that right; there is no ink or toner to buy with a shipping label printer! Ink and toner savings alone will pay for itself. The thermal shipping labels come on a roll. The standard shipping label size is 4” x 6”. The labels are very inexpensive – pennies each. This can lead to a huge savings compared to paper and ink costs. The average label roll has 250 thermal shipping labels. You can load a new roll of labels in just a few seconds. The labels have an adhesive back that will adhere to almost any surface. You certainly will not have any issues with boxes, poly mailers, bubble mailers, etc. Every online seller loves to see orders roll in and items fall into the “ready to ship” queue. However the process of shipping is a task that few look forward to. Shipping product is a business expense that needs to be streamlined as much as possible. Shipping label printers are a great tool to save you time by streamlining the process and cut unnecessary costs related to printer ink, tape, label pouches, and other items that quickly add up to real dollars. Shipping label printers will save you money. Shipping label printers do not require ink or toner! All there is to buy is the printer itself and labels as you need them. This means there is no need to waste your money on ink or toner for shipping labels ever again! Shipping label printers print quicker than an inkjet or laser printer. It takes about 2 or 3 seconds to print a label depending on the model of printer. You can print labels through most ecommerce sites including Amazon, eBay, Etsy, PayPal, Shopify, etc. You can add all of your labels to a print queue and print 20 or 30 labels in about 60 seconds. Then you just stick them on the box. Imagine how much time that would take printing them on an inkjet printer, cutting the label with scissors, and manually taping them on the box. More than a minute, that’s for sure! You will look more professional. Nothing screams amateur more than a label printed on an inkjet printer and taped on the box. Any package you receive from at least a mid-sized company will most likely have a label printed from a shipping label printer. Even if you are just starting out it doesn’t mean you can’t look the part! First impressions play an important in building a base of returning customers. Shipping label printers are low maintenance and are dependable. A single term to describe a shipping label printer is “work-horse”. There are very few moving parts in these printers. They rarely fail. Whether selling on eBay, Amazon, Etsy, or your own website, this is one purchase you will not regret. Ask anyone who ships packages with a shipping label printer. They’ll tell you a shipping label printer will make your life so much easier. If your business is growing to the point where you are starting to ship a decent volume of packages each week, you need a shipping label printer. It will change the operations side of your business for the better. It is a must have tool to run your business in the most cost and time efficient manner. Our top pick for the best shipping label printer is the DYMO LabelWriter 4XL. Probably 65% of eBay, Amazon, and Etsy sellers who use a shipping label printer are using this one. For most small businesses shipping less than 500 packages per week, this is the perfect shipping label printer. It is priced less than a Zebra printer, but is just as reliable. It’s ideal for those who are not in a warehouse environment shipping a very large quantity of product. Below are a list of pros and cons of this shipping label printer. Compatibility. The printer is compatible with eBay, Amazon (including Amazon FBA), Etsy, PayPal and other ecommerce channels. It is also compatible with third party postage vendors including stamps.com, Endicia, and Pitney Bowes. It prints standard 4” x 6” shipping labels. Speed. It prints faster than inkjet printers. It takes about 3 seconds to print a label. The labels have an adhesive back so there are no cutting and taping labels on the package. The time it takes to complete your shipping routine will be drastically reduced. Cost effective. No printer ink, tape, or shipping label pouches are required. The cost savings in ink and other supplies will quickly pay for itself. Reliable. It just works. Since there is no ink, you can always depend on it printing when you need it to. There are not a lot of moving parts to break. It just works. Easy to setup. This is a plug-n-play device. You just plug in the USB cable and set it up as you would any other printer. No technical experience necessary. Size. It is a small printer and will not take up very much space on your desk or shipping station. Its dimensions are 10.2” x 10” x 10”. It’s quiet. It is quieter than a standard printer. The printer requires labels with index holes. It is not compatible with the less expensive Zebra labels. The printer has sensor on the printer head that determines whether or not the holes are there. Using a standard Zebra label would result in the printer returning a “printer is out of paper” error. DYMO’s proprietary labels are more expensive. DYMO recommends you use their branded labels which are usually about 50% more expensive per label than a third party vendor. Per label, the cost is approximately 3 cents each for a third party label vs. approximately 6 cents each for the DYMO brand labels. Many people use the cheaper labels with no complaints. Mac Drivers. If you have a Mac, you will need to download the software from DYMO’s website. It works on a Mac, but the software may not be included on the installation CD. You can print labels through eBay, Amazon, Etsy, PayPal and most other channels with this shipping label printer on a Mac. Tip 1: When you install a new roll of labels into the printer, make sure you discard the first few labels. Otherwise the printer may jam. This is because the first label on the roll is taped down. The residue from the tape may cause the printer to jam. To avoid simply discard the first three labels. For technical specifics of the DYMO LabelWriter 4XL, please see the fact sheet. Important: When buying labels for this shipping label printer, the labels must have index holes! For larger commercial operations, including a warehouse environment, the Zebra GC420d is your best option. This printer is best suited for those printing over 100 labels per day, in part due to its speed and reliability. It has the capability to print any size label up to 4.03” wide, including labels, tags, receipts, etc. This of course includes standard 4” x 6” shipping labels. Compatibility: It works with all ecommerce channels including eBay, Amazon, Etsy, PayPal. It also integrates with third party postage vendors including stamps.com, Endicia, and Pitney Bowes. Recurring costs: Zebra labels are typically cheaper than DYMO labels. Zebra labels do not require any type of index holes. Speed: It prints a standard shipping label in less than 2 seconds. Connectivity: Connects to your computer using a standard USB cable. It also connects via parallel or serial port. Mac compatibility. Zebra does not provide drivers for Mac, Linux, or UNIX. It will work fine on a Mac, but the drivers are not included. Follow the steps in the section below titled “How to Install a Zebra Label Printer on a Mac” if needed. Print quality: The pixel quality at 203 dpi is not quite as sharp as the DYMO LabelWriter 4XL printer at 300 dpi. This does not matter if you are only using it to print shipping labels. Cost: It retails higher than the DYMO LabelWriter 4XL. However, see the pricing information in the “Current Shipping Label Printer Pricing” section for up-to-date pricing to see if it is discounted from the MSRP at all. For the technical details of this printer you can view the fact sheet at Zebra’s website. The fact sheet includes information for both the direct thermal (model GC420d) and thermal transfer (GC420t) printers. For shipping labels, you will want the direct thermal printer. Note: If you need a label printer with network capability, check out the Zebra GK420d. 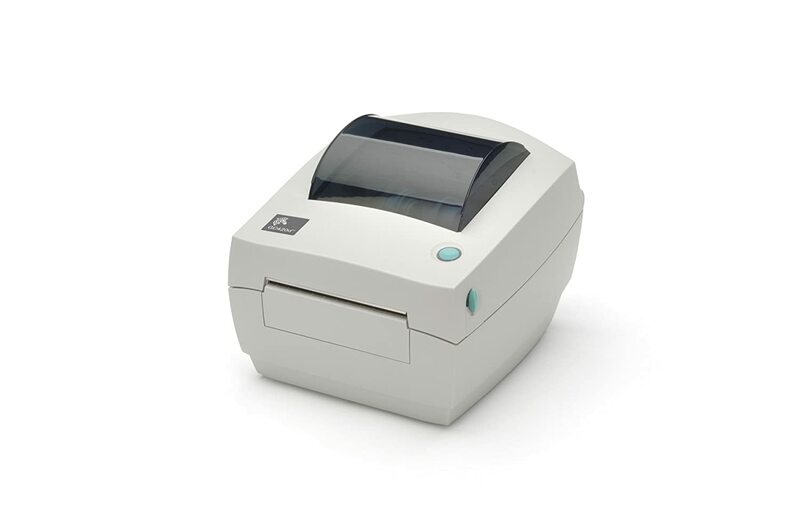 It is a similar direct thermal printer priced around $100 more than this model and can connect to your company network via Ethernet cable. Below is the current pricing on Amazon for each shipping label printer reviewed in this article. The labels you need for each shipping label printer is included as well. You can click on any shipping label printer below to view hundreds of other reviews. The prices below for shipping labels are quoted for multiple rolls. The cost per roll is much less expensive than the price shown. Shipping labels are pretty generic. When buying labels, make sure they are thermal labels that fit your printer. DYMO shipping label printers require labels with index holes. Zebra printers do not. Shipping labels are cheap and become cheaper (per label) as you purchase larger quantities at once. We recommend buying enough labels to last 6 months to a year each time you order. Buying a larger quantity will bring the per label cost down as opposed to buying smaller quantities more frequently. Proprietary labels, such as DYMO branded shipping labels, tend to have a longer shelf life when exposed to sunlight or other weather elements for an extended period of time. Thermal labels use the same technology as most receipts you receive at the grocery store or a department store. Those receipts fade over time. If you are printing labels that need to last for months, you would certainly want to go with a higher quality label. Higher quality labels are recommended for applications such as barcoding or tagging inventory that may sit for six months or more. For the vast majority of users who are only using the printer to print shipping labels, cheaper labels from a third party vendor will do just fine. The chart in the “Current Shipping Label Printer Pricing” section has up-to-date pricing on shipping labels. Keep in mind these prices include quantities of several rolls, not just one. To determine the cost per label, multiply the number of rolls x labels per roll and then divide by the total cost. Each shipping label printer reviewed in this article is a direct thermal printer. This means there is nothing to buy other than the labels – no ink, no tape, nothing. A direct thermal printer uses heat to print onto shipping labels. Thermal labels are made of heat sensitive material. A direct thermal printer print head uses heat to transfer an image from the print head to the thermal material of the label. A thermal transfer printer requires a ribbon. The print head heats up the ribbon to transfer the compound to the label material. You do not need a thermal transfer printer for shipping labels. The advantage of a thermal transfer printer is they last longer, but they are also more expensive. Unless you expect to create more than half a million labels, the direct thermal vs. thermal transfer longevity debate should not be an issue. 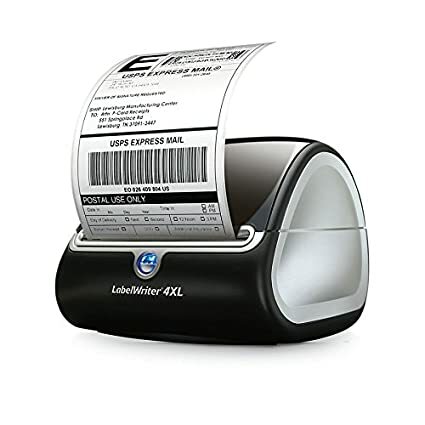 The bottom line is the direct thermal shipping label printers recommended in this article will suit the vast majority of small business’ shipping needs. Shipping label printers that print a standard 4”x6” label have plenty of other uses as well. The printers reviewed in this article print up to 4” wide. They will also print thinner width labels with a length up to 39”. But what if you just want to create a shipping label? Maybe you need to ship an item that wasn’t sold through a major channel with built in workflow. It could be a return label if you need to return an item. Maybe it’s a birthday gift you want to send to an out of state family member. The scenarios are endless. One way to print your own postage is through PayPal. If you have a PayPal account, the process is easy. PayPal has an option to print a shipping label, even if it’s for an item that you didn’t sell. In other words, you can ship a package using the PayPal method even if the person you are shipping to did not pay you through PayPal. You can print labels for Priority Mail, First Class mail, Media Mail, or Parcel Select this way through PayPal. You can also print a label through the USPS website. You will need to set up a free USPS account. Follow the on-screen instructions to generate the label. You can only print Priority Mail labels through this service. If you need to ship a package using cheaper, First Class Mail (13 ounces or less only), you can use the PayPal option described above. And finally, there are third party vendors such as stamps.com, Endicia, and Pitney Bowes. There will be fees involved here, but many business owners shipping on a larger scale choose to go this route. The first time you ship through eBay with a new shipping label printer installed you will have to select your printer in the eBay printing preferences. This will allow eBay to know what size and type label to generate. Follow the instructions below to setup. This setup will only have to be done once. These instructions will work for either of the DYMO or Zebra printers recommended in this article. Even if you are using a DYMO LabelWriter 4XL printer, choose the “Zebra LP2844-Z” option in eBay’s printer preferences. The same label is used to print on either machine. Pick any item that has been paid for and ready to ship. Go to the “Print Shipping Label” page. In the upper right corner, there is a link that reads “Printer and label receipt preferences”. Click this link. Where it asks what kind of printer you are using, select “Zebra LP2844-Z 4×6”. This is true even if you are using the recommended DYMO LabelWriter 4XL printer. The setup is now complete. After your label has been generated, print the label as you normally would. Purchase the FedEx shipping label through eBay. The label itself will be a PDF. Save the PDF to your local drive (My Documents, etc.). The PDF is intended to print on an 8.5×11 sheet of paper. In Adobe Reader, go to Edit and select “Take a Snapshot”. Highlight the area that needs to be printed. The highlighted area is automatically copied to your clipboard. Go to File / Print in Adobe Reader. Select your shipping label printer. Under the “Page Size & Handling” section of the print dialog, select “Fit” and under “Orientation” select “Auto Portrait/Landscape”. By going through the steps above, the FedEx label that was on an 8.5×11 sheet should now fit on your 4×6 shipping label. As mentioned in the Zebra shipping label printer review, Zebra does not provide Mac drivers. However, your Zebra shipping label printer can be installed on your Mac in just a few easy steps. Plug in the printer to the computer via USB and make sure the power is on. In your “System Preferences” click “Print & Fax”. Click the “+” icon under “Printers” and you should see the Zebra printer. Select this printer. In the “Location” box, choose “Select Printer Software”. In the pop-up, select the appropriate printer software. Select “OK”. The printer is now installed and you should see it alongside your other printers. If you have problems installing on your Mac, Zebra recommends you download the drivers at www.cups.org. CUPS is an open source printing system developed by Apple. You can also contact Zebra technical support by calling 866-230-9494 if you need assistance. We hope you have found this article about shipping label printers both informative and useful. We cannot stress enough how much time you will save in your shipping workflow by using one of these. The cost savings will pay for itself. Buying a shipping label printer for your small business is a smart investment. It is a purchase you will not regret. PS – please share this article if you think others would benefit!